Ancient stories of cosmic battles, pitting a celestial warrior against a serpent, dragon, or other monster, were integral to the birth of civilization. From one early culture to another, sacred monuments and rites, religious texts, and cosmic symbols harked back to the age of the gods, to earthshaking upheaval, and celestial combat. One fact is frequently overlooked, however. The context and setting of the later stories progressively changed as the gods were brought down to earth. Over time, the poets and historians placed the stories on a landscape familiar to them. In the course of Egyptian history, for example, the creator Ra and his regent Horus, whose original domain was undeniably celestial, came to be remembered as terrestrial kings. In later time, when Greek and Roman poets, philosophers, and naturalists sought to gather knowledge from far flung cultures, Egyptian priests would relate to them many stories of the gods, declaring that the events had occurred in their own city in the time of the ancestors. By following this evolutionary tendency across the centuries, the researcher can observe how the cosmic thunderbolt, a centerpiece in innumerable tales of celestial combat, emerged as the magical weapon of a legendary hero. It became the sword, spear, hammer or club of a warrior who continued to battle chaos monsters, but no longer in the heavens. As a result of localization, the diminished hero typically reveals an enigmatic mix of god and man, as in the well known accounts of the Sumerian and Babylonian hero Gilgamesh. Once reduced to human dimensions, the hero could no longer hold onto his original weapon, a weapon claimed to have shaken and forever changed both heaven and earth. Localization of the celestial dramas recorded in earliest times had a huge impact on Greek imagination. The best indication of the evolutionary process is Greek epic literature, including the most popular tale of all, Homer's Iliad. Here the greatest of Greek heroes, the ideal warrior, is Achilles. The hero's tale provided the fulcrum upon which the poet integrated different tribal memories, bringing together dozens of tribal heroes upon the battlefields of a legendary, and entirely mythological Trojan War. But the original themes, though subdued, are still present. In the illustration above, from a Greek drinking vessel, we observe Achilles confronting the serpent-guardian of a Trojan fountain. 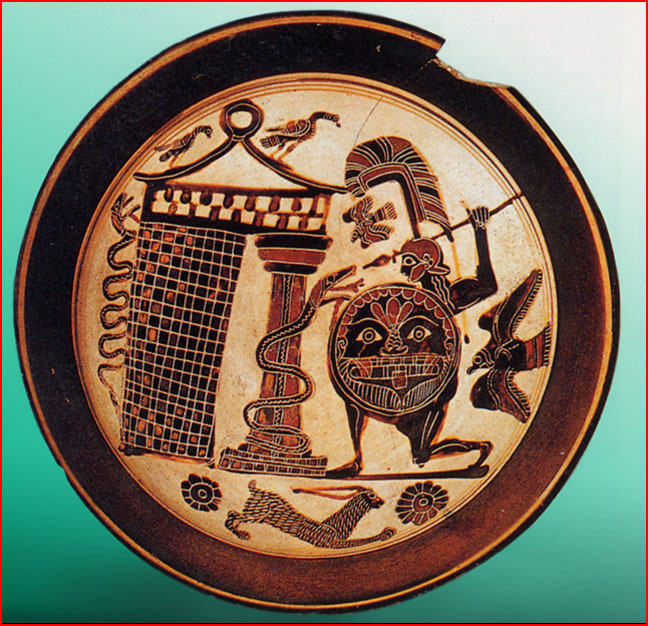 What is the relationship of this image to the archaic contests between warrior gods and chaos serpents? Achilles' father was the mythic king Peleus and his mother the "sea" goddess Thetis, daughter of Oceanus, for whose affections both Zeus and Poseidon had contended. Bathed by his mother in the river Styx, the river that "joins the earth and Hades", he was tutored by the Centaur Chiron. His armor was fashioned by the god Hephaestus, the very god who fashioned the thunderbolts of Zeus. The actual terrestrial city of Troy is the modern Hissarlik in Turkey, the site of a fortified palace from the Bronze Age onward. Neither this palace, nor anything uncovered by archaeologists in the region could have inspired the city of which the poets spoke! In the cultures of the Near East and Mediterranean, hundreds of historic kings left unmistakable proof of their lives and their cultural influence. But of the countless kings, warriors, princesses and seers in the Iliad, not one finds historic validity. The reason for this is that the claimed events did not occur on earth. The original subject was a cosmic drama, whose episodes progressively masqueraded as terrestrial history. It is only to be expected that modern readers would see in these words a simple poetic simile. But is there something more? The answer must come through cross cultural comparison, for the warrior bearing the thunderbolt in battle was indeed a global theme.